(186 x 248 mm) 8.3 x 11.7 in. (186 x 248 mm) 11 x 14 in. (272 x 362 mm) 11.7 x 16.5 in. Usnisavijaya, meaning the “Victorious one (Skt. vijaya) with a Crown Protuberance (Skt. usnisa)”, is a female long-life deity who manifests as an embodiment of enlightenment from the protuberance or usnisa that crowns the Buddha’s head. Her main function is to bestow the realization of immortality by eliminating the hindrances to a long life, and purifying the defilements of body, speech and mind. She is known in Tibetan as Tsugtor Namgyalma (Tib. gtsug gtor rnam rgyal ma), and along with Amitayus and White Tara is one of the great three longevity deities who commonly appear in a trinity. Printed prayers and small clay images (Tib. tsha-tsha) of this goddess, either alone or in her trinity, are commonly enshrined inside Buddhist stupas. 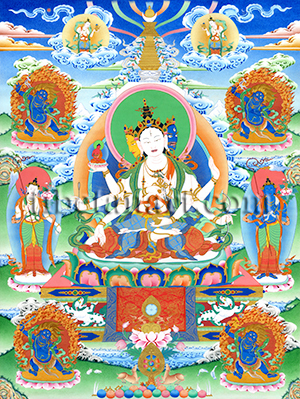 In this beautiful composition she appears in her form as Nine-deity Usnisavijaya enshrined within the central dome aperture of a long life stupa, and is flanked by her two peaceful bodhisattva attendants, white Avalokiteshvara and blue Vajrapani. Surrounding her in the cardinal directions are the four blue wrathful forms of Acala, Takkiraja, Niladanda, and Mahabala, and above Usnisavijaya are two cloud-borne gods who pour down a rain of nectar. Usnisavajaya’s long-life stupa is generated from the syllable BHRUM, which manifests as a jeweled lion-throne with three round stepped terraces, a vase dome with a niche or aperture, a harmika or ‘reliquary-box’, and an ascending spire of thirteen golden parasol-wheels, capped by a rain-cover with a crescent moon and sun pinnacle. The golden spire is adorned with billowing silk ribbons and flower garlands, and generated from the syllable HUM within the aperture arises the radiant form of Usnisavijaya. She is beautiful, attractive and youthful like a sixteen-year-old, with three faces and eight arms. Her radiant white body is endowed with the thirty-two major and eighty minor marks, and she wears the jeweled golden ornaments of a goddess, with upper and lower garments of various divine silks. She sits in vajra-posture on a white moon disc and multicoloured lotus above a jeweled lion-throne. Her pure white form shines with the light of a thousand moons as she sits gracefully within the torana of her stupa, which itself radiates like the light of an autumn moon spreading countless light-ray garlands of infinite life. Her central face is white like crystal with a semi-wrathful expression and a sensually gaping mouth that reveals her twisting tongue and sharp canine teeth. Her right face is golden-yellow with a blissfully peaceful expression. Her left face is blue like an utpala lotus flower, with a wrathful expression, bulging red eyes, fiery facial hair, and a gaping mouth that reveals her four sharp fangs and twisting tongue. Each of her faces has three eyes, and are crowned with jeweled tiaras and a double top-knot. With her first right hand she holds a golden crossed-vajra in front of her heart. The palm of her second right hand holds aloft a small lotus-mounted image of red Amitabha Buddha. Her third right hand holds an arrow; and her fourth right hand makes the boon-granting varada-mudra of supreme generosity, and may occasionally be depicted with an eye of awareness on its open palm. With her first left hand she holds a rope-noose at the level of her heart, with her index finger raised in the threatening tarjani gesture. Her second left hand is held aloft in the abhaya-mudra of protection, granting refuge, or dispelling fear. Her third left hand holds a bow. Her fourth left hand is held in her lap in the dhyana-mudra of meditation, with a jewel-topped golden flask of nectar resting upon her open palm. The bodhisattvas white Avalokiteshvara and blue Vajrapani stand upon moon disc and lotus-pedestals to Usnisavijaya’s right and left, each adorned with divine silks and jewel ornaments. They each hold the ornate staff of a fly-whisk in their right hands, and the stem of a lotus blossom in their left hands, with Vajrapani’s lotus bearing his specific emblem of a five-pointed golden vajra. The four wrathful deities that surround Usnisavijaya are identical in appearance, except for the attributes they hold. They are blue-black in colour, with three round eyes, upward-blazing hair, and are adorned with golden ornaments, a serpent as a sacred thread, a tiger-skin loincloth, and a long billowing green silk scarf. They all stand in pratyalidha posture as they lean towards the right upon a golden sun disc and pink lotus within their blazing aura of awareness fire. They each make the threatening 'raised forefinger' or tarjani gesture with their left hands held in front of their hearts, while their right hands hold aloft their specific attributes. In the East (bottom left) is Achala, who holds an iron sword; in the South (upper left) is Takkiraja, holding an iron hook; in the West (upper right) is Niladanda, holding a skull-topped sandalwood club; and in the North (bottom right) is Mahabala, holding an iron trident. Standing amidst clouds on either side of the golden spire that crowns the dome aperture of Usnisavijaya’s stupa are two young gods, their beautiful white forms adorned with jeweled ornaments and divine silks. They each hold a jeweled gold flask filled with pure water, which they pour down from the heavens as an ambrosial rain of immortal nectar. In the lower foreground of this composition are the offerings of precious jewels, elephant tusks, the seven insignia of the chakravartin or ‘universal monarch’, paired hares and cranes, and two deer flanking the golden wheel or dharmachakra.